In a world where a sense of immediacy rules, why waste 30 minutes to a bank for hard cash when you can have “cash” in just 15 seconds using your mobile phone. Okay more so, electronic cash, but I’m not talking credit cards, although credit cards are involved. Square Inc. has revolutionized a new app, Square (or Squareup), here to narrow the gap of “cash-only” crisis by allowing payment card transactions right in the palm of your hands using your mobile device. This is the first that I've heard of an app like this. Squareup actually came out early last year, but experienced some technical problems, which the developers have assured consumers that have been fixed. The application is compatible on different Apple iOS and Google Android devices. Basically any person with an Apple iOS or Android phone can start accepting credit card payments on the go. You can finally say goodbye to dinners and outings where half the table has cash and the other half credit cards. Use Squareup, and voila no more IOUs. Cash-only crisis, goodbye! 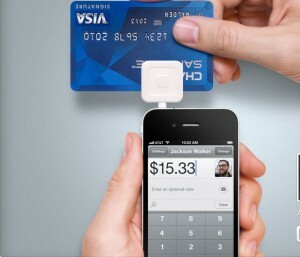 Square offers free application download & account activation. There is however, a processing fee of 2.75% + $0.15 for swiped transactions & 3.5% + $0.15 for keyed-in transactions. So how does this work on your handheld device? Well, with a Square card reader of course! In order to actually start accepting card payments, you’ll have to verify your identity and ability to receive funds, thus handing over your personal info, including your social security number (eeek) to Square Inc. A Square card reader is shipped free after your application process is complete. Square claims to be a ‘charge-per-transaction’ kind of deal, so if you’re afraid of any hidden fees such as an early termination fee, or a monthly fee... you shouldn’t according to the developers. If you’re interested about Square, have pressing questions about security, device compatibility, or in need of more information visit squareup.com. Don’t be afraid to do a more research before diving right into Squareup, but from what I've discovered so far, seems legit. I downloaded the app today, but haven’t punched in my social security number yet (as I’m sure the ssn domain won't sink well with some consumers). I’m curious about the application & am tempted to get my Square card reader, as I will no longer have to wreaked havoc on my freeloader friends.